The Postojna Commune is situated in the southwestern part of Slovenia where the coast meets the interior. Being situated at the crossroad of important traffic links and because of its strategic position between Ljubljana, Trieste (Italy), Gorizia (Italy) and Rijeka (Croatia), Postojna soon became an administrative and business centre of the Notranjska region. Postojna and its surroundings offer visitors many attractions especially the unique natural phenomena as well as cultural and historic sites. The diverse countryside is ideal for jogging, hiking, horseback riding, cycling and other sports activities. 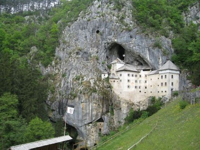 Together with other attractions of the Notranjska region Postojna is an ideal tourist destination which tempts its visitors into discovering some of its many secrets.